Which wordpress cache plugin is fastest ? We assume you are running one of cache plugins for your WordPress site; if not, then you need to implement one ASAP to improve your page speed. It has been preached again and again, your web page loading speed does play an important role in your page ranking. It also helps to retain your visitors. Unless your site has unique contents that visitors must have, you are unlikely to retain visitors to your slow-loading site. HyperCache, QuickCache and W3 Super Cache load up pages slightly faster. But since they didn’t minimize code, speed gains aren’t as significant. Compare that to W3 Total Cache that brought down the number of requests by more than half. The result is a site 2.5x faster than before. So in our specific test W3 Total Cache is the clear winner. Your problem is now “which one for my site?” This little TIP hopefully will help you select the best one for your site. Each plugin has its own legion of supporters that would wholeheartily recommend the plugin of their choice. You will do yourself disservice choosing one simply based on someone’s suggestion. The best way of choosing it is Try It. Record your final page speed. Repeat the routine for all plugins, then compare and select the best one. This site uses W3 Total Cache based on a partial speed test. We have been using WP Super Cache for almost a year. The selection was made without any testing and was simply based how easy the plugin is and how many people are using the plugin. What a mistake. The use of W3 Total Cache was accidental as we decided to switch to it to implement MaxCDN. We are glad that we made the switch and wished we had done it much earlier. What a difference between the two plugins: 79 vs 91 in speed test. We did not test the other two plugins as they are unlikely to dramatically improve page speed beyond the score of 91 (there are many factors beyond our control in trying to improve the speed as suggested by the page speed test). But please DO NOT take our word for it. DO yourself a favor and do not put off by how easy or how difficult to set the settings, try them all, compare speed and select the one best works for your site. There are several WordPress cache plugins out there, and below, you’ll find the most popular, highly recommended ones. 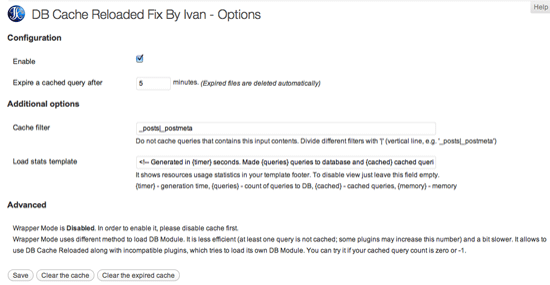 DB Cache Reloaded Fix is a modified version of DB Cache Reloaded, patched for WordPress 3.1 compatibility. 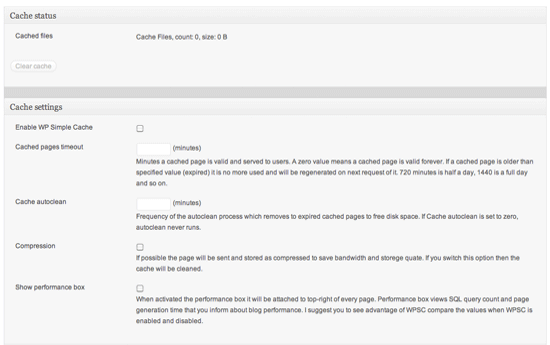 DB Cache Reloaded Fix caches the MySQL queries performed on your database to optimize the site’s speed. While database query caching should suffice for most websites, and the plugin performs fairly well, it’s one of the newer WordPress caching plugins out there, so it hasn’t been field-tested by WordPress users as much as the other older plugins. Hyper Cache Extended, as its name implies, is an extended version of the popular Hyper Cache WordPress plugin. This plugin offers numerous features, such as 404-error-page caching, support for mobile devices, and various compression options. Hyper Cache Extended has a satisfied user base, as evidenced by the ratings at WordPress.org. In addition, the creator, Mapto Lazarov, encourages users of the plugin to email him issues and feedback — a reassuring sign that the plugin is, at present, well maintained by an enthusiastic and helpful web developer. 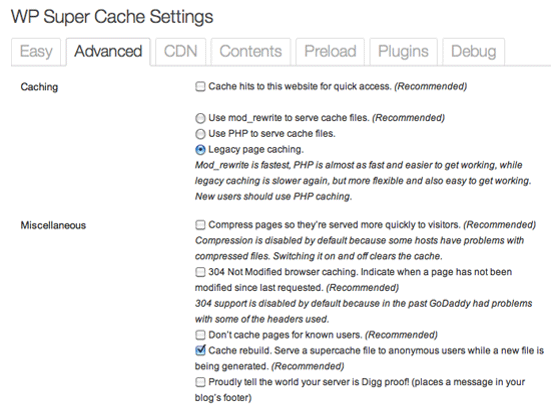 Quick Cache is a WordPress caching plugin designed by Primo Themes. It’s lightweight and has user-friendliness as one of its selling points. The admin interface itself outlines each option in fine detail so that you know exactly what each option does. 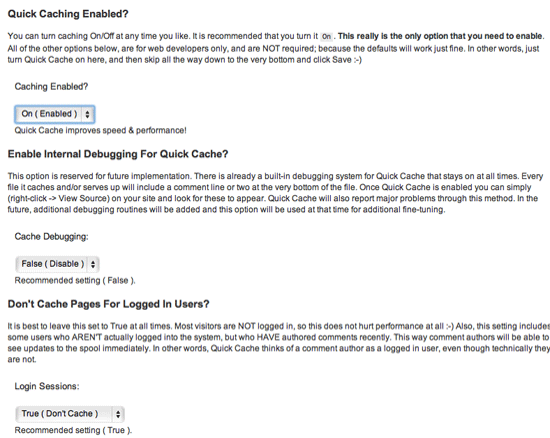 Quick Cache has an impressive list of useful options, including the ability to disable caching for logged-in users and users who have just posted a comment so they can see new comments right away, which is helpful if your site is very active. 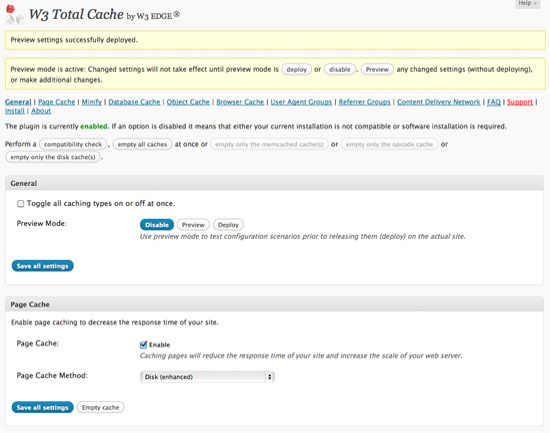 W3 Total Cache is the most popularly known caching plugin for WordPress. 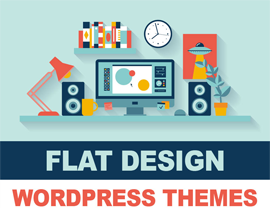 It’s used by several leading WordPress-powered blogs such as Mashable and Smashing Magazine. 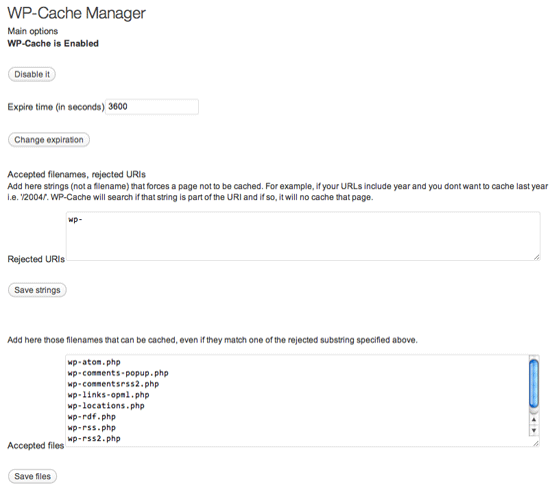 W3 Total Cache claims that your blog can load 10 times faster once the plugin is installed. Personally, I’ve seen the plugin drastically improve load times for older posts and static pages. W3 Total Cache offers a plethora of options and provides you with other site optimization features such as source code minification and integration with your content delivery network (CDN). If you’re uncomfortable with the admin interface (it can seem confusing for beginners), just leave the settings untouched because the plugin operates well at default settings. 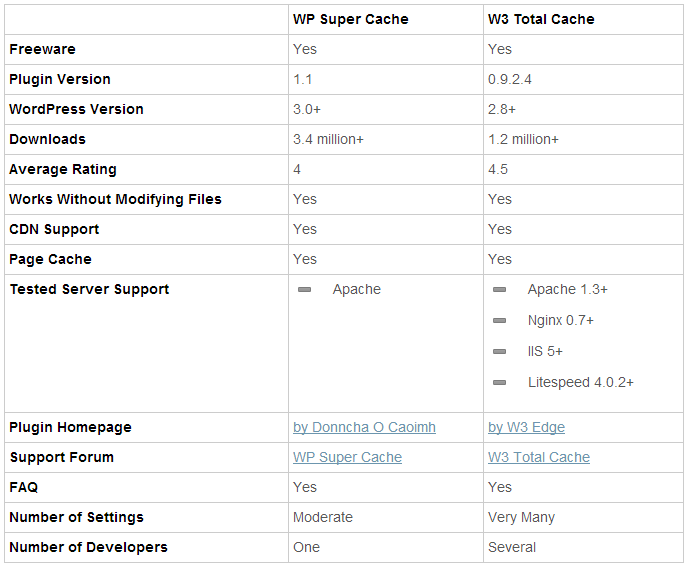 WP-Cache is one of the first WordPress caching plugins, made available on WordPress.org in 2007 — so it has a relatively long track record. It gives you the ability to specify which posts, pages and files shouldn’t be cached. The plugin operates well, but its update frequency is comparatively lower than the other plugins. WP File Cache has a slightly different approach to WordPress caching: Instead of caching an entire web page, it only caches parts of it (usually parts that remain static for long periods of time). Naturally, WP File Cache will not improve the performance and page load time of the website as much as the plugins that don’t require dynamic page generation and is best suited for high-traffic sites that frequently update web pages and WordPress users that would like to control which portions of a web page should (and shouldn’t) be cached. 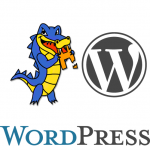 WP Simple Cache generates static HTML files of a WordPress site’s content. 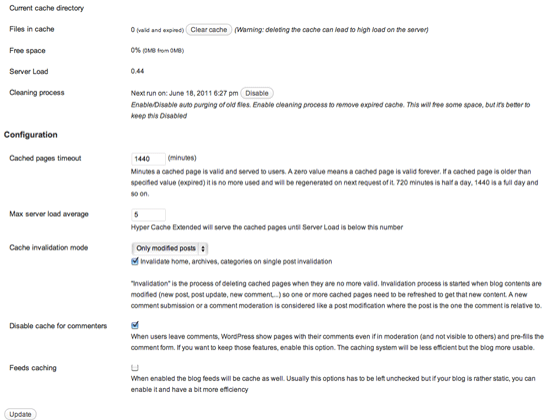 You can specify the timeout settings for cached pages and the auto-clean frequency of cache files. Other than that, as you can probably surmise from the plugin’s name, there aren’t many other options to tweak. The plugin’s home page is in Turkish, so, unless you know Turkish, you shouldn’t expect plenty of documentation at your service. WP Super Cache shows static HTML pages to most of your website’s visitors. The plugin developers claim that if your website gets a large amount of traffic and you’re on an underpowered web server, the plugin works wonders. WP Super Cache can also cache certain WordPress plugins, which can also aid in improving site performance. Both plugins offer several usable categories of caching. The user interface of W3 Total Cache looks nicer than WP Super Cache, but at the same time the options can be a bit overwhelming there. It is a good idea to install both tools, check all the options and decide what you need, but all in all I would stick to WP Super Cache to spend less time fiddling.